What’s valid for car makers, is also true for railways. I am talking about the epic question about their companies purpose. The also talk about transport or mobility solutions that they are offering. And their own company name can prevent them from understanding their purpose. Jonathan Ive, British born Chief Design Officer at Apple, was invited by a British TV channel to evaluate and comment on design proposals for lunch boxes, made by pupils. His response narrows right away in the first sentence down to naming the task. The word ‘box’ could already influence the thinking and the ideas of what the task is supposed to be. If you hear ‘box’ you immediately think of something square, something with a certain shape, which may limit your imagination. Luckily, the kids didn’t let them veer off and submitted proposals that were far off from a square form of a lunch box. The word ‘railroad’ or ‘railway’ is also influencing us thinking in limited terms. 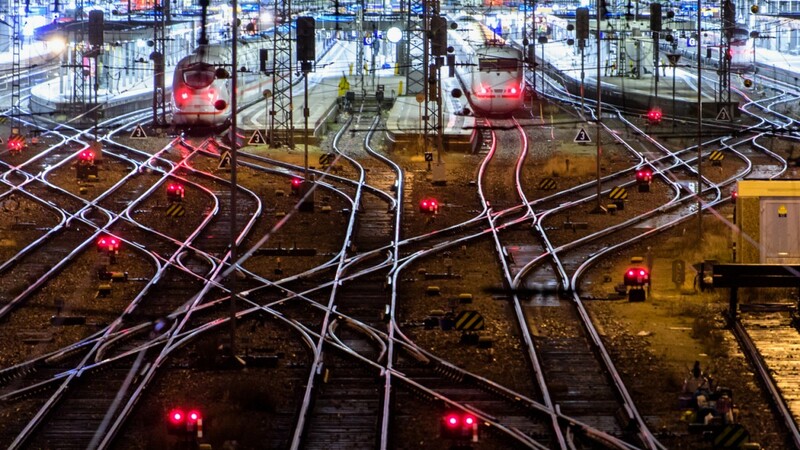 Our mental eyeballs see railroad tracks, engines, and train stations. As a child from a railroad family I also see electric lines and have this metallic, tarred smell in my nose, which I was used to in mu childhood. In the center of attention is always the railroad and we may miss the requirements and needs of customers. With that I don’t mean that there is bad service delivered. European railroad companies are very actively engaging for their customers and want to offer better service. But this is a too mechanic view of the beast. Humans choose means of transports to connect with other humans, with goods, and with places. They have multiple options to connect. From Munich to Stuttgart I can choose the car, long distance buses, the railroad, the airplane, or, if I have time and are fit enough, can walk, take a bike, or ride a horse. Or a combination thereof, whatever I consider most useful or economical. A typical travel like this may start with a taxi ride from home to the train stations, then the train, and finally walking to the destination. Menschen wählen Transportmittel um sich mit anderen Menschen, Gütern oder Orten zu verbinden. Es stehen mehrere Optionen bereit, wie man sich verbinden kann. Von München nach Stuttgart kann ich das Auto wählen, Fernbusse, die Eisenbahn, das Flugzeug, oder wenn ich Zeit habe und fit genug bin zu Fuß gehen, mich aufs Fahrrad schwingen oder das Pferd besteigen. Oder eben eine Kombination davon, was auch immer am sinnvollsten ist, bevorzugt wird, oder am wirtschaftlichsten scheint. Eine typische Reise besteht beispielsweise aus der Fahrt von zuhause mit dem Taxi zum Bahnhof, dem Zug in die nächste Stadt, und dort zu Fuß zum Zielort. But what happens if the customers doesn’t want to? Changing between means of transportation during a travel is exhausting. Walking with your luggage to the connection train, finding your seat or an available seat, get settled, or find the right bus for the next part of the journey disrupt the mobility experience. A self-driving vehicle that you ordered through an app is not something I will use to get to a train. I will remain in the car and take it from Munich to Stuttgart. That’s the disruption for the railroad, that;’s the competition. With that comes the question if it makes sense to categorize transport companies by their means of transport? Airlines by airplanes, railways by trains, taxis by cars? What customers want is a holistic, uninterrupted transport solutions with a seamless service. Apple shows how that works. Hardware, software, and content like music and movies come from one source. That’s why Apple renamed itself a few years ago from ‘Apple Computers’ to simple ‘Apple’ to reflect that change. Tesla – another example – is not just producing cars, but runs their own network of stores, their own charging station system, and mechanic shops. For sure that comes at a premium, but in return customers get a seamless experience. And that puts pressure on other industries. Those types of seamless services are now expected by the customers in other sectors as well. When the shopping process in an Apple store is less than 5 minutes and is so seamless, then my expectations rise, as soon as I am at a car dealership and don’t understand why it takes two hours to buy a car. Back to the railways. Those have (like airlines and taxis) so many break points in their system for a transport experience. The start is that Deutsche Bahn, SBB or ÖBB and any other railway company remove the word ‘railway’ or similar word from their company name ad thus remove the mental box. To highlight that again: I as a child from a railroad family are not saying that with lighthearted. Why would I have to cross through stairs and escalators and the crowd at a busy train station to find the buses, taxis, or other public transport, waiting often far from the station? Why is the self-driving car not just waiting at the side of the train exit? Even more dramatical is the situation for railways when we look at self-driving trucks. The railway’s advantage is to transport heavy cargo over large distances for low prices. But the problem of the last mile remains, where you have to move the cargo from the railway onto a truck. Self-driving trucks don’t need drivers, they don’t need to rest, can drive fuel efficient in platoons and don’t have to move the cargo from railroad to truck. The economic advantage of the railroads are diminishing with that scenario. Companies like Volvo, Ot.to, Scania, and Peloton have demonstrated the capabilities of ‚Road Trains’. The the CEO of Deutsche Bahn, Rüdiger Grube, this trend is visible. With the advent of self-driving cars he was wondering, why there is no self-driving train? And it becomes crystal clear that with self-driving cars railways are losing their advantage with speed and comfort. Who’s still going to a train station? Who’s shopping at the stores there? Why should we spend so much money on railroad infrastructure, which then would lay waste and unused? How’s the railroad going to stay relevant? Can she stay relevant? Public transport in cities in Europe are often very well developed. Even if the residents may not think so and often complain about them, they are reliable, clean, on time, and fast. Especially in Switzerland and Japan the reliability is astonishing. We can always discuss denser intervals and whether the walking distance to the next station is ok. But the discussion will change dramatically for those who used a transport network provider such as Uber. In San Francisco, for instance, where the public transport is outdated and unreliable, Uber has achieved an average wait time for an Uber car of between one to three minutes – and that on the location where I am, without having to walk to a station. My own experience shows how surprised German visitors, who had never used an Uber or Lyft, were. They barely had entered their destination in the app and ordered the Uber, when they saw the car turning around the corner and stop in front of them. No need to cross a busy road and get to the next bus station. Or get up and down of escalators, stairs, and elevators into the belly of a dark subway. Especially women are loyal Uber customers. The digital trace that Uber creates on them is considered to make them feel safe. Electric robotaxis require a renewed evaluation of purpose and service of public transport. In contrast to buses and rail-based systems, autonomous transport providers are not tied to fixed routes. Thanks to digital technology waiting times can be optimized and don’t have to follow a schedule. If those promises can be kept, then the requirements for purpose and service of public transports change. For them we will have to reconsider reserved lanes and tracks, as well as the provided infrastructure. Even their expansion and upkeep with be questioned. The administrators of Charlotte, a city with 800,000 inhabitants in North Carolina, were wondering if their investment of 6 billion dollars for new light rail system is worth it. The systems will start operation earliest in 2025, but at this point they could already be outdated and replaced by self-driving cars. Los Angeles has answered that question with a clear ‘no’ and is waiting for the arrival of electric robotaxis to help solve the local traffic problems. Rail-based systems and public transport are facing their largest changes for decades. The arrival of autonomous cars is questioning their offerings. Rail-based systems, which create a lot of costs for infrastructure, were considered so far to be the most cost-efficient way of transporting large numbers of passengers and cargo – even though highly subsidized. With autonomous cars that’s about to change. Infrastructure projects for new subways and rail systems, will probably be outdated in ten years, when autonomous vehicles dominate streets. The tunnels build at a cost of billions will be just closed right away. At the same time railroad and public transport companies have to move out of their box and discuss whether they should become the operators of robotaxi fleets. With every disruption there are risks and chances. The earlier we recognize them, the better we can react and use the chances. The time frame is between ten to fifteen years. This is a short period for regional planing cycles, and thus should be discussed today.